How do I share this amazing experience? 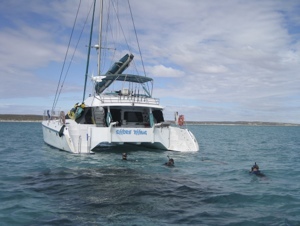 As part of my bucket list prize I spent three days and three nights aboard The Shore Thing, a 51 foot catamaran, sailing and snorkelling off the Ningaloo Reef. There were five clients and three staff which made for excellent attention to all our needs. 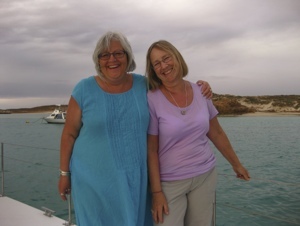 After unpacking Kim and I ensconced ourselves in the nets at the front of the boat and watched the sun set as we drank wine, ate appetizers and got to know our fellow guests. The food was amazingly prepared and presented by Lannie in the small, open galley. She cooked up a storm for breakfast, lunch and dinner, even making deserts that all could eat while only we knew they were also gluten free. Fresh bread was baked daily with homemade soups, wonderful creative salads, and fabulous mains. On the second morning Kim caught a tuna from the back of the boat and we had fresh ceviche and fresh tuna skewers for dinner. Breakfasts alternated between cooked and continental with lots of coffee for those of us that needed it after our wine from the night before. Every evening after dinner we would make our way to the front nets and listen to the lapping of the waves and hope for stars as we sipped our wine and dreamed of sailing away forever. It’s been a long time since I was lulled to sleep with the gentle movement of a boat at anchor and I was torn every night – stay awake on the deck or crawl into my berth with the hatch wide, and drift off to a lullaby sleep. I swear it was a struggle every night! The days were full. 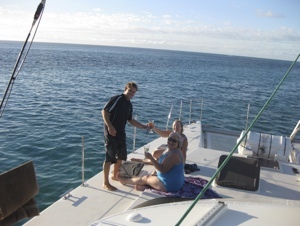 Up early for breakfast; move the boat to a new site for a dive and a snorkel;have a light snack; move the boat; have lunch and some fishing or relaxing time; another snorkel and sometimes a dive;move the boat; perhaps a kayak and a walk on a deserted beach; drinks and appies; dinner on the back deck; fishing or looking for bait balls (a large group of congregating fish) by flashlight; a little more wine and off to bed. All ready for a do-over tomorrow. We snorkeled at so many great spots and the scuba divers felt the same way. There was “So-so Reef” christened that because it wasn’t; a nameless reef (or maybe Luke just wasn’t saying) where you felt you had inserted your head into someone’s home aquarium; a beautiful blue coral garden full of fish and blue neon tipped stag horn coral. I could go on but I won’t. I have never seen so vibrant a reef in all my years of snorkeling. It beats Hawaii, Mexico and Belize. Our last day was spent searching for co-operative Manta Rays and after the first one who disappeared far too quickly, we managed to find one who would “play the game” as Travis so aptly put it. We swam with him for more than an hour. I had no idea how large he actually was until a couple of people dove down beside him. My guess was seven plus feet. This definitely was an experience I will treasure for the rest of my life. Thank you, thank you, thank you Luke, Lannie, Travis, and Down Under Answers. To tell you the truth, Australia was never really on my bucket list but now that I have experienced it, I wonder why not. 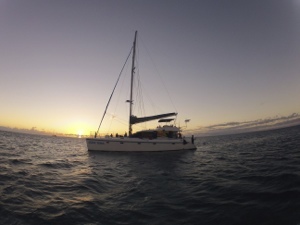 This entry was posted in Australia, ningaloo reef, sailing, shore thing, travel and tagged Australia, Ningaloo Reef, Sailing, Shore Thing, travel. Bookmark the permalink. Great post – Ningaloo is on my to do list! And I am very jealous you got to see a manta! Did you dive or snorkel? And did you see any whale sharks?! Ningaloo is on my to do list! Did you see whale sharks?! And very jealous you got to see a manta! Peggy Lee I am a snorkeller not yet a diver. But saw so much life nonetheless. And for whale sharks I was blessed to swim with them at Exmouth. Truly an awesome experience. I have another post about that. Yes Jonas, it was very wow. Better than I could have imagined. Don’t you love it when reality beats out fantasy? !